My friend’s (who I will call her Pippa) daughter (Chantal) is leaving home next week for university. In the last year Pippa has been counting down the days with dread. On one hand she is excited for Chantal as she steps out into her new adventure but on the other hand Pippa does want her to go as she knows she will miss Chantal. She recognises that she will have feelings of loneliness and grief and therefore will be suffering from empty nest syndrome. I suffered a taste of these feelings of loneliness when my own children started school. They were with my 24 hours a day for 5 years and suddenly I had to let them go for 6 hours a day. I had a feeling of purposelessness. It took time to adjust (including lots of tears) and I found myself having to put things in place to fill the hours. With this loss in mind, I feel for my friend coping with her empty nest. Pippa says she will miss her daughter and will find it hard to adjust to not knowing where Chantal is every minute of the day or seeing her face everyday. Pippa accepts that it will be a loss and that she will have to grieve for the loss. However, she has also identified that it will be about her losing her primary identity as being a mother. In the last 18 years although she has a part time job and several interests, it has all been focused around her daughter activities. She says it will feel strange not having to arrange her life around someone or having the constant chatter in the kitchen. Her house will feel empty. 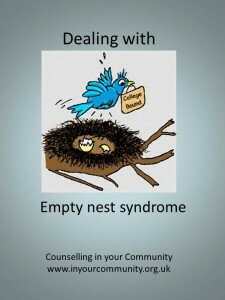 How to cope with empty nest syndrome. Through our conversations throughout the year we came up with a list of things that Pippa could put in place to help her through this transition and and I thought it might be useful to share it now to help cope with empty nest syndrome. 1. Be constantly involved in the decision making. Pippa helped Chantal with her University choice by visiting them with her. Together they drew up positive and negative list to help Chantal decide where she wanted to go. 2. Communicate with your child. Keep the communication channel open and let them know how and when they can contact you. Pippa has arranged to talk to Chantal once a week via skype. 3. Accept your loss and let your feelings out. Yes, go on, have a good cry. If possible try to talk to someone who is sympathetic and understanding to your loss. 4. Give yourself time. You need to adjust not being needed on a daily basis. Accept that empty nest syndrome is a loss. You need to grieve as well as find new things to fill up your time. 5. Reassure your child that you are always there and your home is there for them. If they ring up homesick, support them through these emotions and help them to learn how to be independent themselves. 6. Look at your own needs. If you have feelings of loneliness, why not revise old friendships, take up new hobbies, increase hours at work (or consider voluntary work). 7. Examine the positives of your child leaving home. No dirty washing, no nagging, cook the dinners you like. It is important to recognise that empty nest syndrome can bring about feelings of loneliness and grief and to put small steps in place to help you through this difficult time. Hazel is a Sheffield counsellor providing face to face counselling in Sheffield and online counselling. she specialises in loss and grief. This entry was posted in loss and tagged empty nest syndrome, feelings of loneliness, leaving home, loss on September 18, 2014 by Hazel Hill.